Rabbi Itamar's influence is far-reaching and alive, his family a beacon of light for the nation. 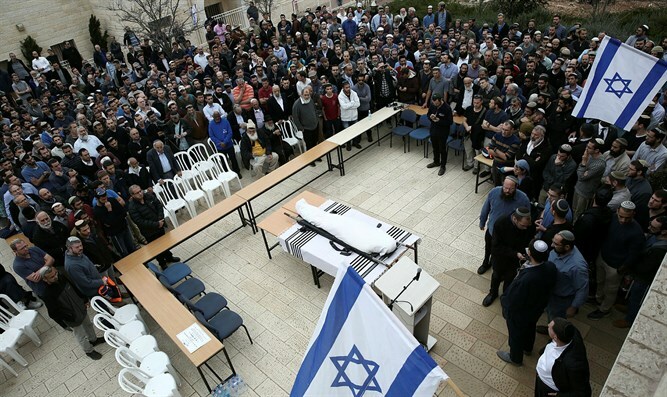 Numerous people from every sector came to console the Ben Gal family during the 'shiva' (week-long mourning period) for Rabbi Itamar Ben Gal, Hy"d (trans. May G-d avenge his blood, ed. ), who was sanctified in his death for being a member of the Jewish people who, after 2,000 years of exile, returned to settle the Land of Israel as written in the words of the Torah and the Prophets. In his life and death, he gave his heart, soul, and might for the sanctity of the Torah, the Nation, and the Land. As fitting for someone who dedicated himself to make his home in the frontline of settlement in Har Bracha in the heart of Samaria and was killed in the sanctification of God's name, many Rabbis, Ministers, and Members of Knesset arrived, as well as from the Zionist Union party (although no one from Yair Lapid's 'Yesh Atid' party came). There were also groups of secular people not identified with the Right who came to console. Representatives of our Samaritan neighbors also came to participate in the shiva, as well as Arabs in contact with the community of Har Bracha. At the end of the 'shiva', Rabbis came to speak, and each added a level of their own. 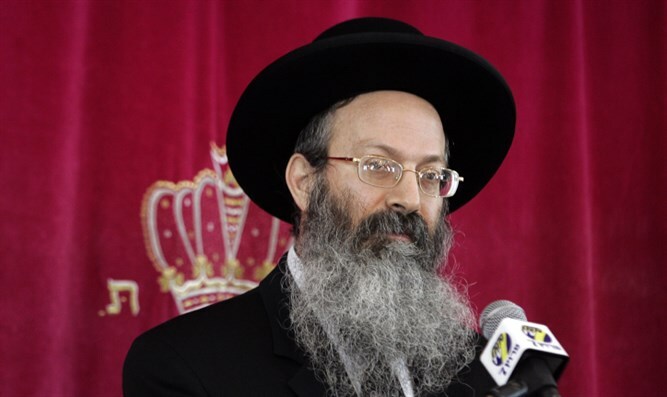 Rabbi Shmuel Eliyahu spoke about the prophecies being fulfilled today, the Chief Rabbi of Israel, Rabbi David Lau, spoke about the 'emunah' (faith) revealed through Purim. At the closing memorial meal at the end of the 'shiva', Rabbi Ben-Yishai, the father of Ruth Fogel Hy"d, killed in the sanctification of God's name together with her husband and three children in the community of Itamar, also participated. With all his heart, he spoke about eternal life intensified through 'mesirut nefesh' (self-sacrifice), radiating light and blessing over all of the Jewish nation, and already personifying an aspect of 'techiyat ha'maytim' (Resurrection of the Dead), as sparks of their personality become part of the lives of many. His words were of deep comfort, beyond description. Then his son-in-law stood up and added that the family members of the 'kedoshim' (the holy ones) who carry on, are transformed into a beacon of light for the public at large, and as they are strengthened in 'emunah', the public is strengthened in their power. Venerable Religious Zionist leader Rabbi Druckman spoke about the life of man in this world, that in the end, even the greatest 'tzaddikim' (righteous individuals) must die. The question is: did a person really live his life to its fullest, or was he like the wicked who are considered dead, even while alive? When a person clings to Torah and mitzvoth, and is even killed for the sanctification of God's name, he is alive – truly alive. Rabbi Eyal Vered spoke about the saying 'shavik chaim l'kol chai' (he returned his soul to the Creator), that when the righteous die, they bestow their lives for all those left alive in the world, who can thus continue to advance and ascend. Once again, I marveled seeing how the Torah revives and sweetens life,, with each Rabbi adding a unique clarification to enlighten and elevate listeners. Before President Rivlin's visit, the community leaders asked me to come and honor him, but his visit was a great disappointment. He failed to empathize with the mourners, or their way of thinking and beliefs. I tried suggesting he recite the blessing of "matziv gevul almana" ("Blessed be He who sets the boundary of the widow", the blessing recited upon seeing a new community in the Land of Israel), which in this context took on a double meaning – first, over the newly settled area of Har Bracha, and second, a blessing for Miriam the widow. The President, however, interrupted me and did not allow me to finish. When the father of Rabbi Itamar, Rabbi Daniel, asked to speak a little about his son, the President interrupted him in the middle of his first sentence, saying that he had already heard about him. When the mourners spoke about the desire to settle the Land, he voiced reservations for all sorts of reasons. Firstly, he said it's improper to build in the wake of a terror attack; rather, to build the way his forefathers who immigrated to Jerusalem built, without any terrorist attacks. Second, he said there are different opinions, and it's a complex matter. Thirdly, if this is the situation, perhaps citizenship should be given to others as well. In short, every time the mourners tried to speak, they were interrupted by the President with disapproval and rebuke. The mourners were extremely distressed at the end of the visit. In order to console the mourners, I told them after he had left that the importance of the visit was that it had ensued at all, because after all, this is the man serving as President of the State of Israel. In contrast, my wife informed me of the visit of the Prime Minister's wife, Sarah Netanyahu, who radiated warmth and love to the mourners, hugged the widow and mother, took an interest in their lives and their children, listened attentively as they talked while caressing the widow, and was all kindness and empathy. This can only come to teach us the extent of the secular media's distortion of reality in order to advance its positions. Other public figures, including Ministers and Knesset members who came to console, willingly recited the blessing "matziv gevul almana", including MK Eitan Cabel of the Zionist Union party. The 'settlers' in Israel are like the little Dutch child, putting their finger in the dike of the world. A Righteous Gentile from Holland came to the 'shiva', and in front of everyone (including the students of Rabbi Shlomi Badash the widow's father, from the yeshiva high school in Karnei Shomron) mentioned the famous tale of the little Dutch boy who stopped a leak threatening to bring down the dike, thereby saving his city. He declared to all the listeners: "I came today to say on behalf of millions of people around the world – today, you are the finger of the child blocking the dike that saves the world from the evil of Islamic terror." A while ago, I met Rabbi Fruchter, the head of the yeshiva high school in Givat Shmuel where Rabbi Itamar taught. Upon mentioning that Rabbi Itamar was particularly successful in his educational mission, I told him my hopes that he would develop and become the head of a yeshiva high school. He replied: Already he is like the head of a yeshiva. After Rabbi Shabtai Sabato, head of Yeshivat Mitzpeh Yericho, finished giving a shiur between the afternoon and evening prayers, his student Binyamin Badash, the brother of Miriam, the widow, accompanied him and told him sadly about the loss of the future expected for Rabbi Itamar Hy"d Rabbi Sabato comforted him, and said: I have been the head of a yeshiva for decades, and privileged to raise thousands of students, but have failed to achieve what Rabbi Itamar has accomplished. He has risen to become an educator for the entire nation, many of whom hear about his noble leadership and dedication to Torah and the teaching of students, and become stronger and elevated in the light of his image. Rabbi Elisha Henshke told us: When I came to check out Yeshiva Har Bracha in 12th grade – a doubting and wary 18 year old – I was afraid the great honor I had witnessed ascribed in the yeshiva to the world of the workplace – to the holiness hidden in the secular – may lead to a lack of diligence in Torah and the revealed holiness. I was contemplating on this when suddenly, the tall figure of Rabbi Itamar, then a fourth year student, caught my eye. He sat down in his spot in the front of the Beit Midrash (yeshiva study hall), and buried himself in his learning. At that moment, I decided to study at Yeshivat Har Bracha. A few years later, he gave me his detailed summary of the laws of Shabbat, so I could use them to study for the rabbinate, which I often used. Years later, amid the days of the onset of winter, rain storms and gale winds periodically cause power outages in the community. One particularly bleak and bleary Friday morning, my cell phone vibrated. On the display – a message from R. Itamar had been sent to all the yeshiva students. I fail to recall the exact wording, however, but unlike the cold and angry storm outside, it particularly warmed my heart. I still remember its gist – even though two or three years have passed: "A warm and healthy winter to all. Do not forget to stock up on warm clothes – if you need anything, I'm here. Love, Itamar." The message was something like that; its content was a bit longer. Just a simple, motherly reminder. When I saw him a few minutes later, I wanted to compliment his devotion, and I told him he could be a "wonderful mother." He chuckled as usual and changed the subject, but for me, the winter gloom was replaced by a spring-like wave of heat. Thus, in addition to his countless hours of Torah study and deeds for the sake of the 'Klal' (the public as a whole) that I witnessed over the eight years I was privileged to know him, I saw him as the diligent idealist, courageously laboring over the Torah on the one hand, and as a loving and giving person on the other. An Arab, whose son had served in the IDF and was killed in the defense of Israel, also came to console, and expressed full solidarity with the Jewish people. Not only that, he even requested to come consult with me about his conversion. Having studied physics, he was accustomed to learning, and had already studied books such as the 'Kuzari', listened to Torah lectures on the Internet, and wished to convert. He believes he has Jewish roots as well. However, his wife is not interested in converting, but if he does not divorce her he cannot convert, since the Torah forbids a Jewish man to live with a woman who is not Jewish. He asked what he should do – whether to divorce his wife whom he loved? I answered that it would probably be better if he remained with his wife, and live his life as a Righteous Gentile observing the Seven Noahide commandments. I added, however, that in the merit of his question, I would try to examine a very important issue: Is it possible today to reinstate the law of 'ger toshav' (alien resident). A 'ger toshav' is a non-Jew who accepts upon himself in front of a 'Beit Din' (a Jewish court of law) faith in the God of Israel, and commits to fulfill the Seven Noahide commandments. As for the rest of the mitzvot – if he fulfills them, he is rewarded; if he does not fulfill them, he has not sinned. In terms of his status, he is a partner with the Jewish people, it is a mitzvah to reciprocate with acts of loving kindness as with Jews, and 'l'chatchila' (from the outset) he is permitted to reside in the Land of Israel. The problem is that according to halakha (Jewish law), only a rabbinical court of 'dayanim smuchim', an unbroken chain of tradition and authority dating back to the time of Moshe Rabbeinu, has the authority to accept a 'ger toshav' (Rambam, Laws of Avodah Zarah 10: 6). Indeed, even according to strict law, a regular 'ger tzedek' (a true convert) must be accepted by 'dayanim smuchim'; however, since we have learned a general rule that in all generations, there must be the possibility of conversion, although 'semicha' (rabbinical ordination) has been discontinued, we continue accepting converts. The question is: can a way be found to accept a 'ger toshav' in our times? Such a status can serve as a solution for descendants of Jews who, according to halakha, are not Jewish; they can convert and be given the status of a 'ger toshav' who, in all civilian aspects, is a full partner of the Jewish people. It would be fitting for some Torah scholars to research this issue, in order to clarify it from the ground up. If there is anyone among the 'lamdanim' (scholars well informed in rabbinical literature) who can help clarify this issue, I would be delighted to receive his opinion.